Steins;Gate is an absolutely fantastic visual novel. And while it has been released on the PC in the US (and will be hitting the PS3 and Vita next month), it’s far from the only Steins;Gate game out there. And no, I’m not talking about the upcoming sequel, Steins;Gate 0; I’m talking about the three spin-offs. The first of these is Steins;Gate:Darling of Loving Vows, a “what if” romance visual novel taking place in a world-line far different from those we see in the original game. In the Darling of Loving Vows’ delta world-line, the world is a much nicer place. While past-changing D-Mail’s do exist, there seems to belittle SERN influence in the world and certainly no team of rounders hunting Okabe and his friends. In fact, Okabe’s biggest problem is that, in order to pay the bills at his laboratory, he has to get apart-time job as a waiter. Of course, being a romance visual novel, each of this game’s routes deals with Okabe falling in love with a different one of the female Steins;Gate cast members and starting a relationship her. 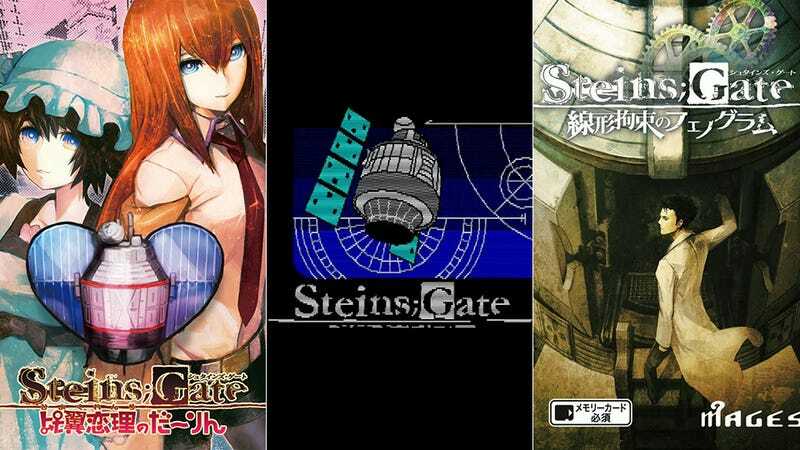 The second game is Steins;Gate:Variant Space Octet, a non-canon sequel to Steins;Gate.In it, Okabe must find the IBN5100 in Akihabara and stop the mysterious “Neithardt” before he uses it to pervert the Steins;Gate timeline and bring about the chaotic future of the (I swear I am not making this up) moé-pocalypse. Unlike the other Steins;Gate games, Variant Space Octetis not a fully-voiced visual novel with excellent art. Rather, it is an old-school 8-bit adventure game where you have to type in commands to perform various actions. The third game, is Steins;Gate: Linear Bounded Phenogram. Generally more serious than both its light-hearted dating game and tongue-in-cheek adventure game predecessors, this visual novel is a series of side stories set in realities both eerily familiar and strikingly different from the original. What’s interesting about this collection is that only two of the game’s eleven short stories follow Okabe. The rest of the game’s chapters follow characters other than Okabe, allowing you to see their thoughts instead of Okabe’s—giving each a vast amount of character development. So, if you, like me, can’t wait till November for the release of Steins;Gate 0–and can read Japanese—maybe these games will help sate your appetite.